For first time mothers, the feeling of insecure abdominal muscles comes as quite a surprise following birth. Your once supportive abdominal muscles are now dealing with the after effects of stretching and supporting a growing baby. For experienced mothers, this feeling might be something you’re not looking forward to dealing with again, knowing the feeling of a complete lack of support. You might remember holding your belly with your hands or a pillow when you tried to get out of bed. If you had a c-section, your pillow was likely your best friend for several days. Postpartum recovery isn’t always something your friends tell you about, perhaps because it’s something we accept as part of the postpartum deal. The good news is you don’t have to wait until you’re cleared for exercise before you’re able to feel abdominal support. Fortunately there are some great products you can use to help. From left over fabric to more structured commercial products, there’s available support long before you’re cleared for exercise. What Types Of Postnatal Belly Support Are Available? When you hear the word ‘wrap’ you might think of the multilevel marking products aimed at losing weight. While both MLM weight loss wraps might be marketed towards new mothers, the wraps and bands discussed here are not the same. They aren’t designed for weigh loss, they’re designed for support and wellness. Postnatal support bands like Mamaway’s fantastic Nano Bamboo Postnatal Recovery & Support Belly Band (pictured below), are very simple to use products. They’re similar to medical style compression bands, but are often made of comfortable materials, and provide a comfortable level of compression and support. There are several brands of postnatal support belts on the market, that come with a range of features, prices, materials and quality construction. Belly binding, wrapping and postnatal support is something we see in many traditional cultures. However, these postnatal support bands offer the benefits of traditional wrapping, with the convenience of a simple to use product. So if you aren’t committed or interested in learning wrapping techniques, this is your go-to option. Bengkung belly binding doesn’t require a specific product – just a long piece of properly sized fabric. Many work at home mothers and specialty boutiques offer ready to use hemmed and properly sized fabric to use as a Benkung belly bind. This type of binding requires a bit of a learning curve, but it provides excellent full abdominal support. The art of Bengkung binding is a traditional one that’s gaining mainstream popularity as more women learn about the benefits of postnatal support. Like Bengkung belly binding, this is a traditional art which provide postnatal support. It can be done with any fabric, including the breathable muslin fabric. This style of wrapping is something a woman can do herself after a little bit of practice. These are similar to structured postnatal support bands, but they are approved by your doctor for use immediately following surgery. The advantage to using this after a c-section is knowing it’s a safe support product while still healing from abdominal surgery. 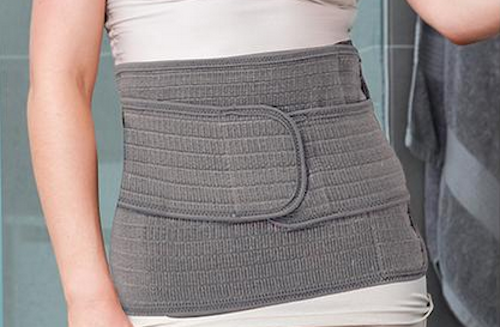 Not all structured binders are approved for c-section use, but the Nano Bamboo Postnatal Recovery & Support Band is. Some women also use rebozos (long scarves), their ring slings and other fabrics to provide postnatal support. Why Is Postnatal Abdominal Support Helpful? During pregnancy your uterus expands to support a growing baby. During this process your organs shift, your abdominal muscles are stretched and strained, and your hips and ribcage spread. All of these changes mean that after the birth, you are left with weakened abdominal muscles that can strain your back, organs not quite back to their normal location, and your uterus is still enlarged for six weeks. Compression can provide support and encourage your body to get back to its typical state. What Are The Benefits of Postnatal Belly Support? Will A Binder Or Band Help Me Return To My Pre-Pregnancy Body? A binder or band can help your uterus get back to its pre-pregnancy size, helping to support your hips and pelvis as they get back to their pre-pregnancy state. By helping the uterus get back to its normal size, it can help your belly shrink a bit. Bands and binders also act like a girdle, and may improve your self-confidence as you start to get out and about again. However, a binder isn’t a substitute for proper postnatal rest and healing, a healthy diet and exercise. It’s also important to remember that your body just made a human – which is no small feat – and it will take sometime to heal. Your body took 9 months to go through such a change, so give it some time to return to normal. Many women find self-care, a good diet and exercise helps them feel their best and that a binder helps them during the transition. Their body might not go back to its exact pre-pregnancy state and it might look and feel different, but it can be a very healthy and attractive one. Hey, Thanks for your post. Can we wrap belly using fabric after 7 month of delivery.. Will this technique be effective?? I have undergone c-section. Any research out there to support this practice?